“Burgers?” my Mom said in shock. “That should be interesting. I’d love to try your burgers.” she quickly added not to hurt my feelings. “It was Jason’s idea,” I said apologetically. When he suggested that I make burgers for my parents, I thought he was kidding. “They live 5 minutes from Fuddruckers!” I told him, “They’ve had plenty of burgers.” “But have they had your burgers?” he asked. He had a point. I’ve been obsessed with making a perfect burger for the past 3 years. It all started with my internship in Casablanca restaurant. In the end of the night, Ali, one of the line cooks, asked everyone what they wanted for dinner. The options were roasted chicken, burger, or a salad with some veggie sides. The weight conscious side of me always asked for a salad, but one night I was so hungry and so tired that I asked for a burger. “O-Ma-Gawd!” I mumbled with my mouth full, and the juices running to my elbows. I leaned over the counter so that I don’t drip on the kitchen floor. “This is so good.” Ali smiled. I squashed the bun around the beefy goodness with both hands and took another bite that revealed the pink and succulent center. That was my first real burger and I’ve been on a quest to reproduce it ever since. I’ve asked Ali to show me what he did, but he just shrugged, “You just mush the beef into a patty and put it on the grill.” “But how much do you season and how do you know when it’s done?” I asked. “Once you make enough burgers, you’ll know,” Ali answered. The problem was that I don’t eat that much meat, and my burger practice of 3 times a year was not persistent enough to produce consistently excellent burgers. Doneness was a particularly big problem. Feeling how firm the meat is might work for a steak, but does absolutely nothing for a burger. With the burgers you have to dig in and look inside. The trouble is that digging in created such a pool of juices it’s hard to see the color of the meat without pouring out all that juice – not a good solution either. This burger quest seemed so hopeless, that I gave it up completely and tried to find a restaurant that would serve a perfect burger. To my great surprise, I found that it was practically impossible to find what I was looking for. It was a rare case when the burger was perfectly seasoned, and even rarer case when it was cooked to medium-rare as requested. And not even once have the planets aligned for a burger that was both seasoned AND medium-rare. “But surely, in culinary school they’d teach us how to make a perfect burger,” I thought when I set off on my boot camp adventure at CIA. We went around the room on the first day introducing ourselves and saying what we were hoping to learn. When I said that I wanted to learn to make a perfect burger, people gave me strange looks. Sadly, burgers were not on the curriculum. There was only one thing left to do... buy 5 Lb of ground beef and make burgers and more burgers. Throwing food away makes me feel really bad, but eating this much beef makes me feel even worst, so I settled for the lesser of two evils. The recipe that finally led me to success was Michael Schlow’s. His timing was dead on and the grilling technique flawless. The only thing that I changed was the seasoning. Instead of mixing all of the salt into the meat, I only mixed a little of it in and sprinkled most of it on the outside once the burgers were shaped. That’s the way Ali used to do it in Casablanca. By my third try I was getting pretty confident and Jason, my quality assurance department, proclaimed these to be the best burgers in Boston. But even if they are the best burgers, who (besides me) cares? Since we already bought ground beef, Iggy’s phenomenal black pepper brioche buns, and all the fixings the morning of my parents’ visit, there was no turning back – burgers it was. I was a little nervous that I’ll overcook them, and then not only will I be serving burgers, I’ll be serving bad burgers. But everything went as planned. The mushrooms got sautéed; the buns got toasted and slathered with garlicky borsin cheese; the burgers got grilled and rested. We opened a good bottle of pinot noir and toasted my parents’ visit. I held my breath as my Mom and Dad took the first bite. When I heard “Oh-ma-gawd!” I knew I got it right. About that beef: Michael Schlow calls for 80% lean / 20% fat beef, and if you can find it more power to you. When I made these burgers for my parents the second time on the 4th of July weekend in Baltimore, I found 80/20 beef at Whole Foods. But the Whole Foods in Boston area is a bit too “health conscious,” so they only carry 85/15. It makes excellent burgers too, but if you go any leaner than that, I cannot be held responsible for the results. In a small bowl, mix salt and pepper. Combine ground beef with olive oil and one-third of salt/pepper mixture. Mix well and divide the mixture into 4 patties 2/3 inch thick. Make a slight indentation in the center of the patties to the thickness of about 1/2 inch to prevent your burgers from blowing up into meatballs. They’ll even out during cooking. Line a cookie sheet with paper towels, put the burgers on top, and press another sheet of paper towel on top of burgers. This will keep them dry before you grill them so that they can brown before they overcook. If not grilling immediately, keep burgers in the fridge (no longer than 1 hour). Get all your fixings ready. Preheat the grill to high. Have a timer handy. When ready to grill, season burgers on both sides with the remaining salt and pepper mixture (yes, it’s a lot of salt, but that’s what it takes to flavor ground beef). Immediately put the burgers on the grill (don’t cover). After 1-1/2 minutes, give the burgers a quarter turn to make grill marks. Cook 1-1/2 minutes. Flip the burgers and cook for 1-1/2 minutes longer. Another quarter turn and another 1-1/2 minutes. So, a total of 3 minutes per side for medium-rare burgers (4 minutes per side for medium-well). I grill my buns during this time too. Turn off the grill. If using cheddar or some other cheese you want to melt, put it on your burgers now and cover the grill. Wait 4 minutes without opening the grill. While the burgers are resting, get the buns ready with the fixings. Place the burgers on top and enjoy. I like lettuce, tomatoes, and thinly sliced red onion on all my burgers, so use them as you see fit. Phew – that was a lot of instructions. But you wanted a perfect burger, right? How funny! I was just thinking about burgers this morning... Australian burgers at that from the corner take- away... I'm on a mission to recreate them! Thanks for the tips! Tanna, good luck with your burgers! Ok - i have to bookmark this one since my burgers are extremely prone to collapse. Your respect for humble ingredients exemplifies your love for good food, as does your brilliantly conceived and written posts. I really enjoy reading them. You've shown impeccable technique here, and I would only suggest a small tip. 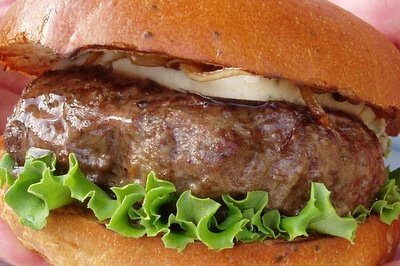 Overmixing can be a great burger's undoing, so I would caution working the meat too much during the mixing step. You really hit the nail on the head with your meat / fat ratio and admonition to liberally salt the meat. I'm foaming at the mouth thinking about it. I love meaty burgers like this. A burger isn't a burger unless its packed with meat, sorry Vegos. I'd love to try this. Oh my gawd these look good. Any suggestions for the bbq-less? Have you tried a stove top grill? Or the broiler? I'd try a grill pan (one of those cast iron ones with ridges) on very high heat with the same timing as in the recipe. Then pour of the grease, top with cheese (if using), cover, and finish in 250F oven. I've never tried that, but this seems the closest to the bbq method. I don't think broiling would brown them much. next time, try your burger with a couple of slices of pickled beet, some fried onions, and a slice of grilled pineapple... then you'll be coming close to an Aussie burger! Omit the pineapple if you're not that keen, but the beetroot is definately vital! Careful of red beet juice dripping down your arms! I have done black-bean burger, tuna burgers, turkey burgers and yet other burger-manifestations. I have yet to master the original, however, due to my similar inconsistancy in beef consumption. Wow, that was a sentence. I am happy to find the original recipe somewhere, especially with a dose of gourmet cheese. PS. how do you get those awesome food pics? Mine turn out quite blurry--check out my blog to see--though don't tell The Boyfriend. He is the photographer. Bonnie, the Aussie burger sounds fabulous! I would have never thought of putting pineapple on a burger, but it would be worth a try. Gnomey G, about those pictures... I am still a beginner with this, but here is the most important thing I learned so far -- it's all about lighting. The firt burger picture was taken outside, the second was inside with the help of a little construction light I use for food pictures. Holding your camera steady makes a big difference too. Try steadying it on something to avoid shaking your hands. Just thought I'd add two important things Helen forgot to mention. If you're using a point-and-shoot camera (just about anything under $500), turn off the flash and set it to macro mode (look for the flower icon). Then, go to your local hardware store and get a simple light socket (with attached cord; use a 100W bulb). Have someone hold the light bulb in various positions while you're taking pictures (no flash & macro mode). A digital camera is nice since you can see the result immediately. Good luck! Tried it, loved it! We'd swear that our barbecue is standing a little taller, looking a little prouder! Tried it, loved it: DITTO!! (We did find them a tad salty, also the portion size daunting, even for a husky 16-year old with a usually bottomless stomach.) But still, MUST say, these are GREAT burgers! Will make some small adjustments, can't wait to try the Aussie version. Aren't those monster burgers? Schlow's recipe was for 9 oz ones, and I scaled it down to 8 oz, but still... When we have them, we don't do any appetizers and definitely no fries -- just a side salad. I don't see any problems with making them smaller. Just shorten the cooking time slightly. I expect that as long as you keep the same thickness, the diameter won't make as much difference. Helen's burgers and the Aussie variety both sound great. I love using pineapple in savory dishes - pizza, enchiladas, salsa. 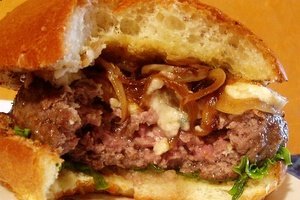 What restaurant serves the best burger in the Boston area ? I'll be visiting soon so I won't be able to cook my own but my family loves a good (for me bunless since I'm gluten free) burger. In the northern suburbs of IL, where I'm from, the best burger is found in a shack of a place called Charlie Beinlich's in Northbrook. It is delicious (and I can eat the fries since they are the only food placed in the frier!). Mmm, what I wouldn't do for a great (medium Rare) burger! Bartley's in Harvard Sq. -- I haven't been there myself, but my husband works nearby and he tried them and said they were quite good for a restaurant burger. Cooked medium-rare as he asked and pretty well seasoned. The only complaint was that the bun was the usual mushy type. At home we get really good brioche buns from a bakery, so we are spoiled. Casablanca, also in Harvard sq. But that was several years ago when I used to work there. The chef has changed since, and I haven't been back in a while, but the line cook who made the best burgers still works there. His name is Ali, and I believe he is now their sous-chef. What you can do is walk in and ask if Ali is working. If he is, mention to the waiter that you heard he makes the best burgers and see if you can get one. If Ali is not working, I don't know if I'd risk it. after planning to try this recipe using beef, we ended up using turkey -- same everything, only cooked it a bit longer. And it was great! Sometimes the simplest seasonings (oil, salt, pepper) are the best. Thank you for sharing your learnings with us! Australian Burgers are by far the best burgers in the world. I know...i thought it was wierd too! I do a 50/50 mix of ground sirloin and ground beef. Kosher sea salt and fresh ground pepper to season. Extremely hot gas grill and I use a thermometer to check for internal temp. First burger I made on my brand new grill - LOVED THEM.